After two episodes full of heavy action and heightened emotions, Revenge stepped back into more of a slow burn mode tonight, dealing with some immediate threats while setting an interesting canvas for the future. The most immediate threat to Emily’s plans is Eli, her former foster brother who comes into town after Charlotte contacts him about Amanda’s death. He presents himself as a clean-cut Columbia alum used to rubbing shoulders with the elite, but the second he realizes Emily is actually Amanda, it’s obvious there’s more to him that that, as you can’t con a con. Turns out his trick is selling counterfeit rare books to the rich. Emily offers to help him get out of the game forever by erasing his criminal record and giving him money to start over, but instead of taking her up on it, he decides getting in with the Graysons (and sticking around to see what else he can potentially garner from knowing Emily’s secret) is a far better play. It’s the way Eli ingratiates himself that feels so perfect, though. The Graysons decide to immediately capitalize on Amanda’s death by setting up a charitable foundation in her name and throw the requisite fundraising party to get things started. Daniel—still caught in the middle of some sort of hilarious ‘80s movie downward spiral about how being a rich, privileged white dude is Really Very Difficult—finds out that Conrad and Victoria are only even creating this foundation so they can hide all their money in there in case the Initiative situation causes an investigation to freeze their assets. When Emily tells Ashley Eli can’t be trusted, and then Victoria finds out Emily’s concern, Victoria appoints Eli co-chair of the whole foundation. Between Eli as co-chair and Aiden as treasurer (set up to take the fall if the money gets “mysteriously” missing), the Graysons appear to have all their bases covered. They do leave one door wide open, however. When Daniel has a crisis of conscience and tells Emily all about the foundation as a money shelter and the Initiative’s plans to have him set up their next big plot, Emily realizes how she can take down the Graysons: by stealing all their money right out from underneath them. When Nolan uses his Carrion technology to attempt this, however, things start to finally get interesting. Instead of letting him in, he gets a message from a hacker who set up a protection on the account, the only hacker that’s ever been better than Nolan and the same hacker who helped the Graysons set up David Clarke: The Falcon. It’s hilariously melodramatic and the kind of fun the show hasn’t attempted in quite a while, with extremely silly Matrix-esque graphics and an over-the-top name. Now the question: Who is The Falcon, and when can we meet him or her? Because I kind of can’t wait. Other than Emily, the only other interesting thing happening in this episode is Jack and his decision to let anger guide his way. Jack spent most of this season idly standing by while his family got taken advantage of, but since Amanda’s death, he’s done a complete 180. In fact, his new attitude of lying to people while seeking the answers behind their back feels a lot like what Emily’s journey might have started out as, which is an interesting parallel for the show to attempt. Between giving Victoria a completely insincere blessing to start the Amanda Clarke Foundation and hugging Nolan in the most insincere way possible after Nolan lied to him about chartering his rescue boat, Jack is setting up his own little revenge fantasy in his head, and Nolan and Emily might just be high on the list of victims. This could all be resolved by Nolan and Emily simply coming clean, but they’re both too far down the rabbit hole to see what Jack is capable of. 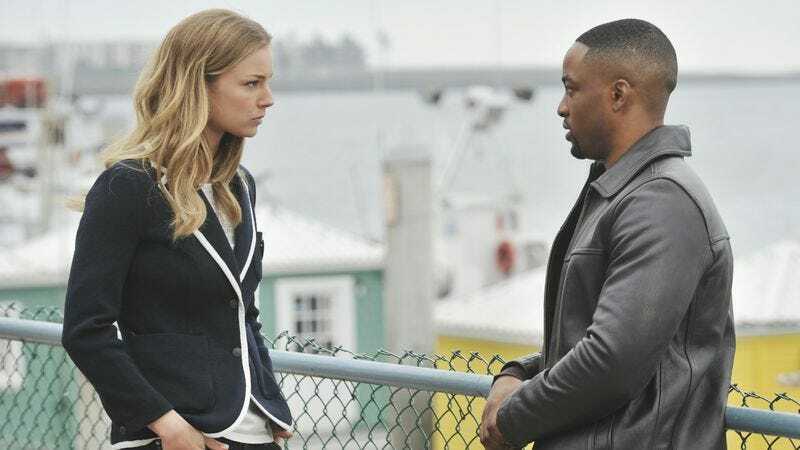 Although Revenge is awash with new energy and focus since Amanda’s death, one thing is still a problem, and it’s the same problem the show has had all season: Just what is the Initiative up to? If they want to cause a disaster so they can profit off the cleanup, just come out and explain it! This is a despicable thing, something the audience could easily grasp onto and root against, so I’m not sure why the whole thing is still shrouded in so much mystery. Let us hate them, Revenge! Was the show setting up a bit of a love triangle between Declan, Charlotte, and Eli tonight? That’s not promising. Nolan’s party outfit was absolutely divine. He looked like Formal Wear C-3PO. How long until Emily and Aiden's secret love shack becomes the scene of something nefarious? I give it three episodes. “You think you want my life? Careful what you wish for.” Seriously, Daniel is one coke habit and a few popped polo collars from being in Wall Street.